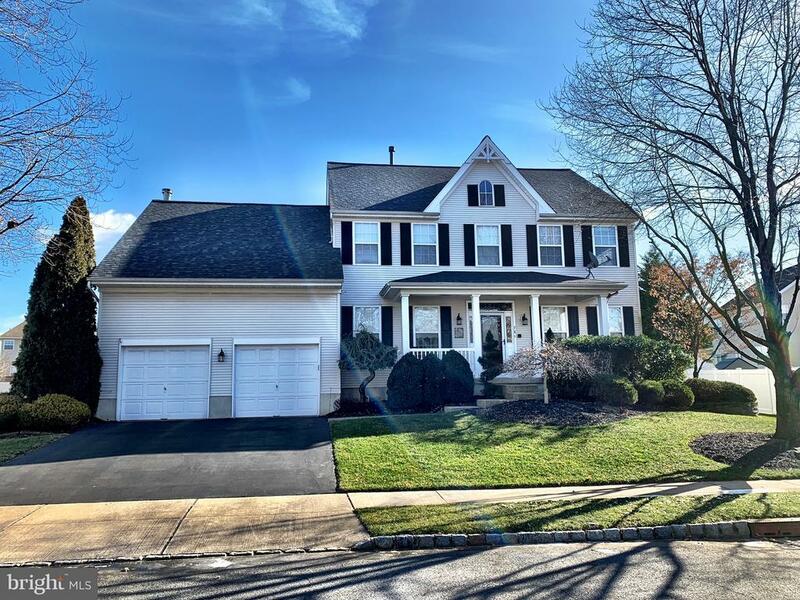 Beautiful Inside & Out is this Spacious 4 Bedroom, 2 Full & 2 Half Bath Foxhall Model with a Full Finished Basement & Backyard Inground Pool that is nestled on a Premium 1/3 Acre Lot in Desirable Steeplechase Development, Burlington Township. Grand Two-Story Foyer greets you with upgraded front door that is accented with crown molding & gleaming hardwood flooring that flows into the Kitchen Area. Updated Kitchen with Breakfast Room features granite countertops with island/stove & bar overhang, oak cabinetry, tile backsplash, under cabinet lighting, pantry, double stainless steel sink plus Slider access to the Backyard Oasis Gunite In-ground Swimming Pool. Sunken Family Room provides a vaulted ceiling, newer Berber carpet, gas fireplace with stone around & wood mantle & two skylights. Living Room & Dining Room flow from one another offering endless possibilities for entertaining family & friends that include upgraded carpeting & wood trim accent. 1st Floor Office contains matching book-shelving & desk with recessed lighting. 2nd Floor Master Suite features vaulted ceiling, large walk-in-closet, ceiling fan with light & recessed lighting; Master Bath offers travertine tile stall shower with bench & glass around, travertine flooring, soaking tub, upgraded double sink vanity & upgraded lighting. Three other nicely sized Bedrooms are all in close proximity to the 2nd Full Bath. More Room to Grow can be found in the Full Finished Basement with raised ceiling that offers a Great Room, Game Room, Exercise Room & Workshop plus plenty of space for storage, surround sound. Additional Features Include : New Roof, 2-car attached garage with openers, Two-Zone Heat/Air, Front Porch, Wired Nutone entertainment package throughout the home, Gunite Swimming Pool with new heater (25k gallons), Trex deck, Vinyl maintenance free fencing, freshly painted Shed to store all of your outdoor toys & Lawn Sprinkler system. Move-In Condition! Great Location! Close to Major Highways, Military Base, Shopping, Restaurants, Schools & Parks. Worth a Look! Directions: Columbus Road to Tack Way to Steeplechase Blvd. Exclusions: Refrigerator in Garage, Freezer in Basement. Inclusions: Washer, Dryer, Refrigerator, Pool Equipment, Pool Table, Piano, 1 year Home Warranty.